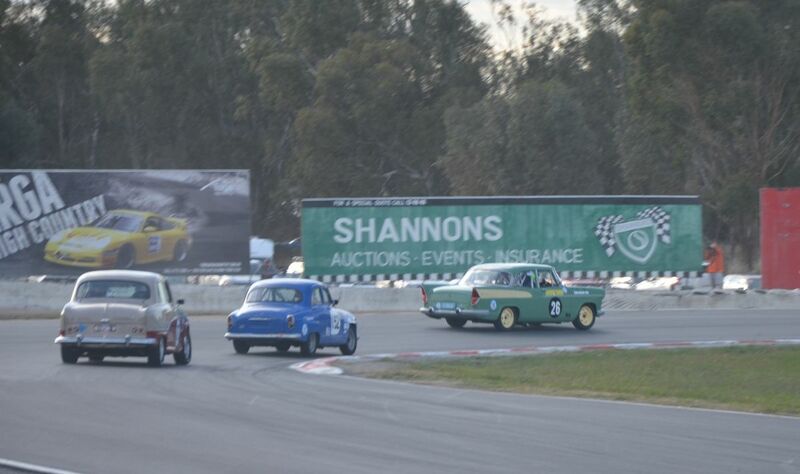 Last year at the Historic Winton races there was a sight that I think won’t have taken place in Australia for probably 50 years: a pair of Simcas on a race track at the same time! Things are already started, as the cars were near the back of the touring car field, but let’s go and have a closer look. Here are the two cars in the pits; a 1957 Aronde 90A (1290cc) and a 1958 Vedette (2351cc). 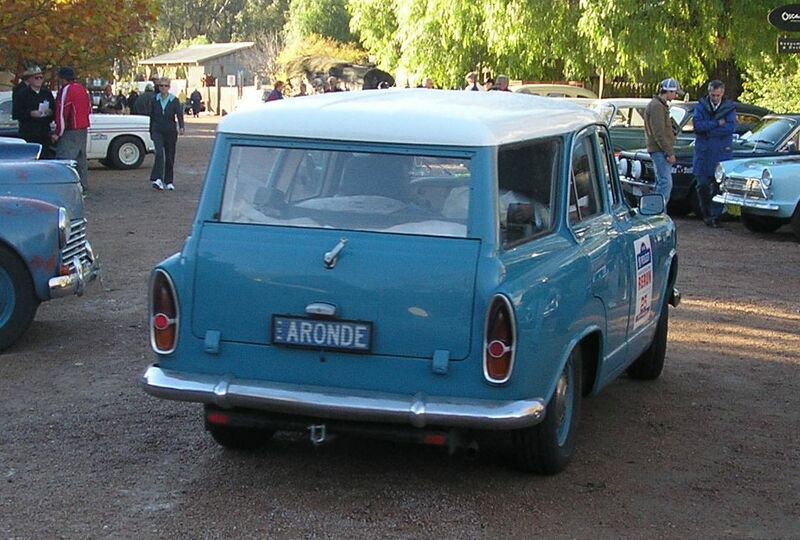 The Aronde is from NSW and has been around for years, although I am not sure I’d seen it before, while the Vedette is a local car (from Victoria) that was restored a couple of years ago. 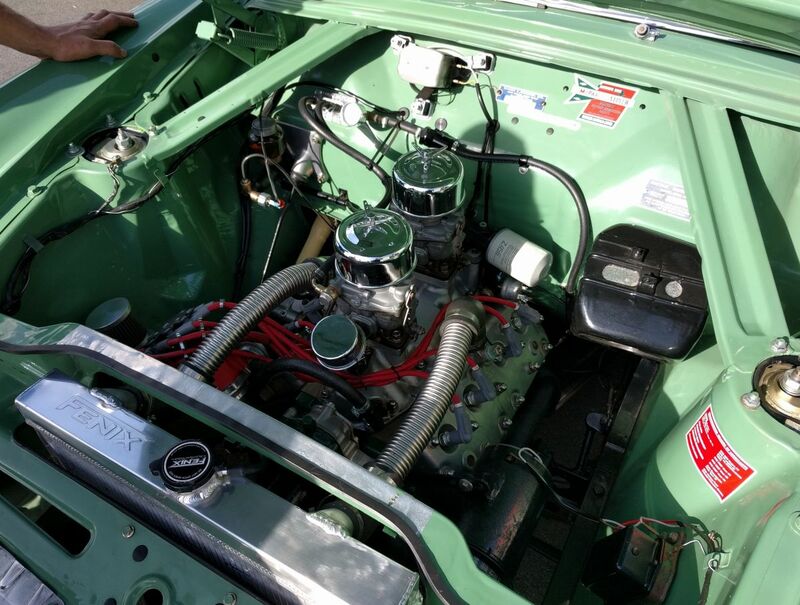 I’m sure everyone is itching to see the Vedette’s throbbing V8, so here it is! It is of course a French evolution of the small Ford V8-60 flathead. The class that these cars run in, Group Na for cars before 1958 (but encompassing models that continued unchanged beyond this date), is quite restrictive as to modifications. 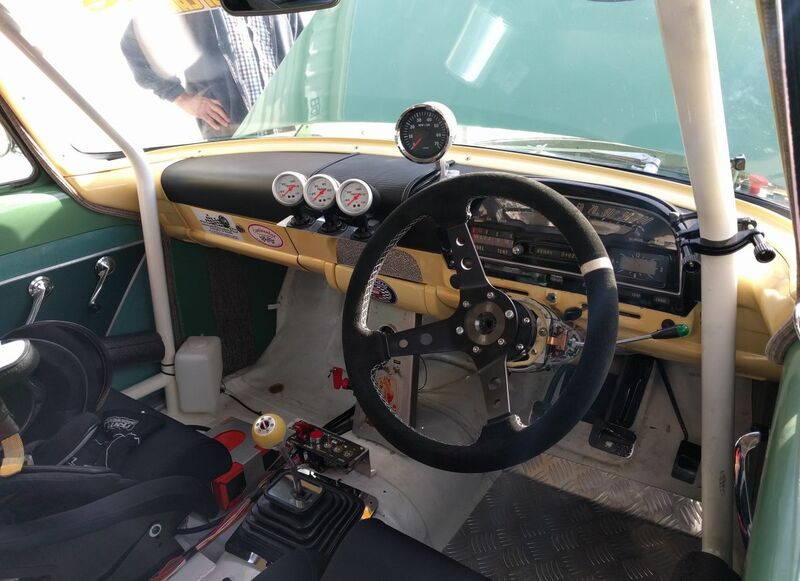 The interior is not quite as period-correct, due to safety considerations – for example when these cars originally raced there wouldn’t have been any form of rollover protection. It is a requirement to retain interior trim with the exception of carpet or other floor covering. 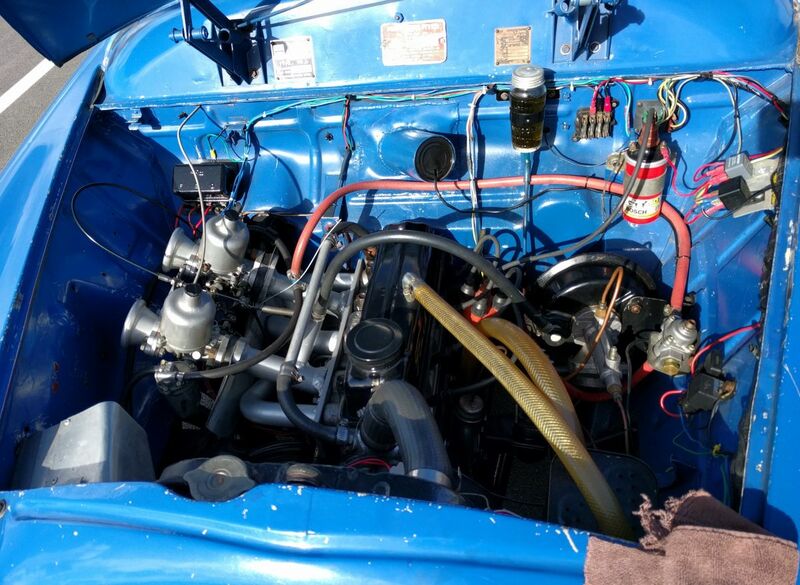 Here is the Aronde 90A engine. Lots of development no doubt, but tightly controlled. The foreword to the regulations for the class contains a statement to the effect that it is about getting old cars out on track in period style, and if you are all about going fast, look elsewhere! The intention is that the cars should still be capable of being driven on the road because in period a dedicated racing sedan was very unusual. The Aronde is indeed the slower of the two, but I doubt the owner is bothered. This is done for fun, after all. 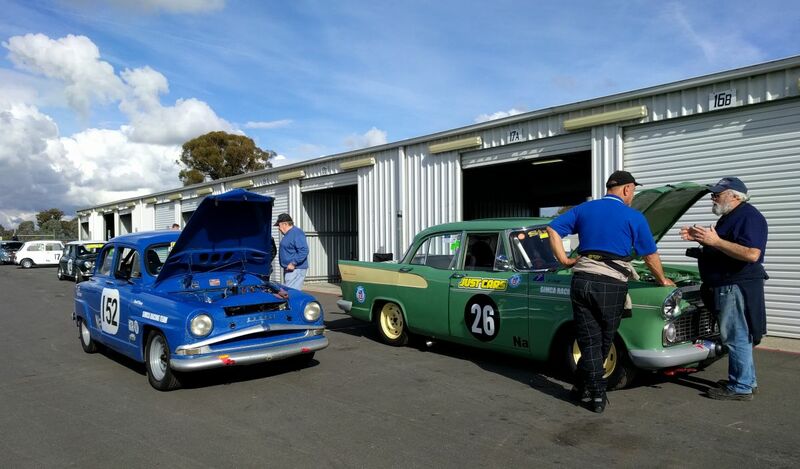 Historic Winton is a pretty unique event, and last year was the 40th running. As well as cars it also features motorcycles and sidecars, making for an incredible variety of vehicles from 30 to over 100 years old. Here is a shot of the Vedette on track. Well ahead of the Austin A90 Westminster at least! 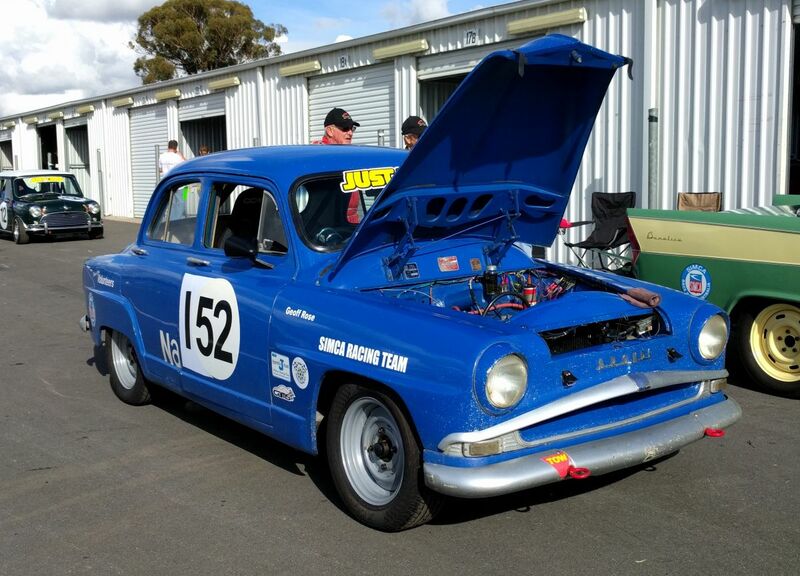 There are usually an early Holden or two running in this class too, but not today. There was another Aronde parked in the display area. Paul is familiar with these cars. 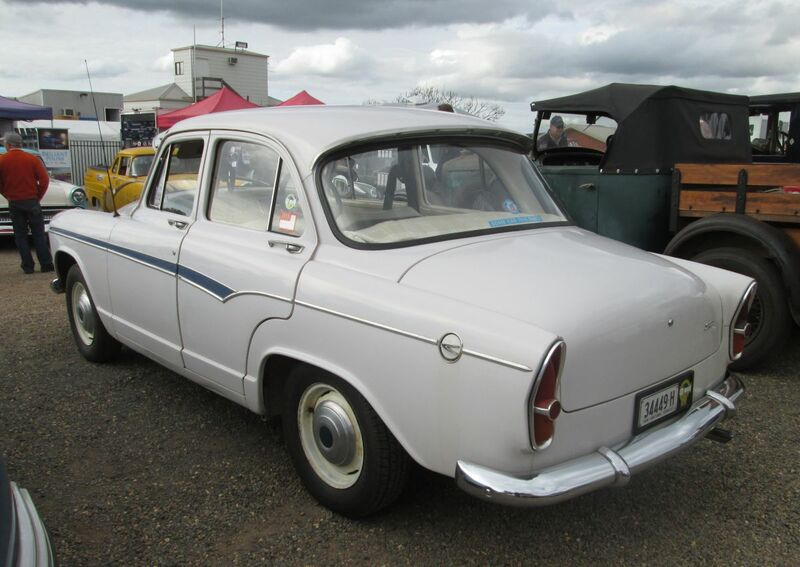 An a fourth Simca, this time a Chambord, which has been featured on CC before from Brazil. I am not familiar enough with Australian Simca history to know how they fit in here. 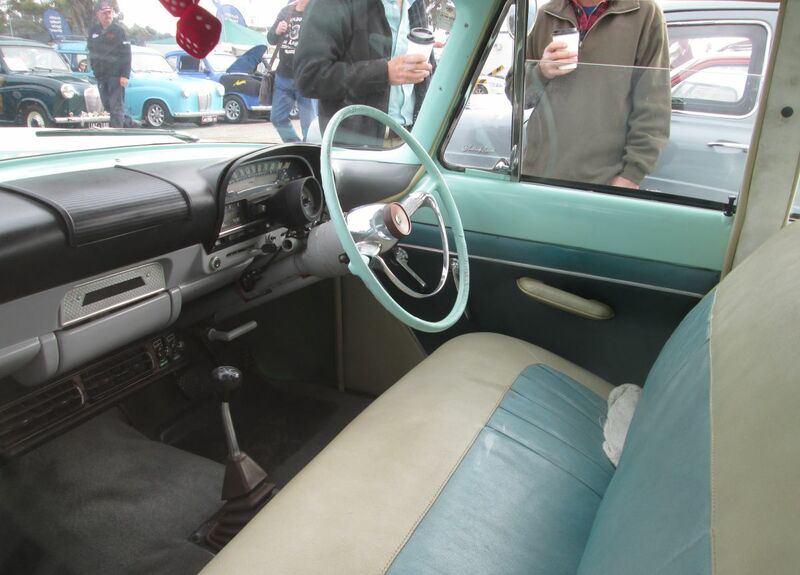 The Vedette was built in South Australia by Chrysler, but I suspect this car may have been privately imported. It is a pretty stylish machine. It looks like a smaller version of a US car – for good reason, if you read the link above. I’ll come back to this event in the future as it has some great stories for CC, even outside of the cars on track. Takes me back to my childhood, when Simcas were everywhere. All the Vedettes I saw were Beaulieus, never saw a Chambord. 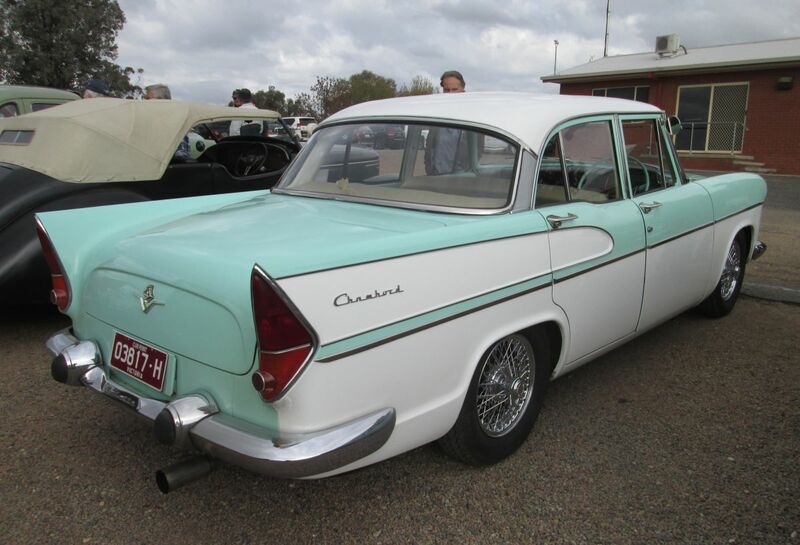 A near neighbour has three of these a Vedette with flathead V8 a Chambord with 253 Holden power and a Ariane same body with the four cylinder ‘Rush’ motor, popular as taxis in France years ago big cars but with good fuel economy which the V8 didnt have. When I was a kid, the Aronde could be seen in the wild even in Tucson. I don’t remember seeing any Vedettes (were they ever imported into the U.S.? ), but whatever their faults, they’re lovely to see here, full of the finny American details. To us in the U.S., that teeny flathead is just so cute. It’s hard to imagine that there was any real advantage to that little V-8 over a biggish four, except perhaps smoothness. But that exuberant 1950s styling is nearly irresistible. 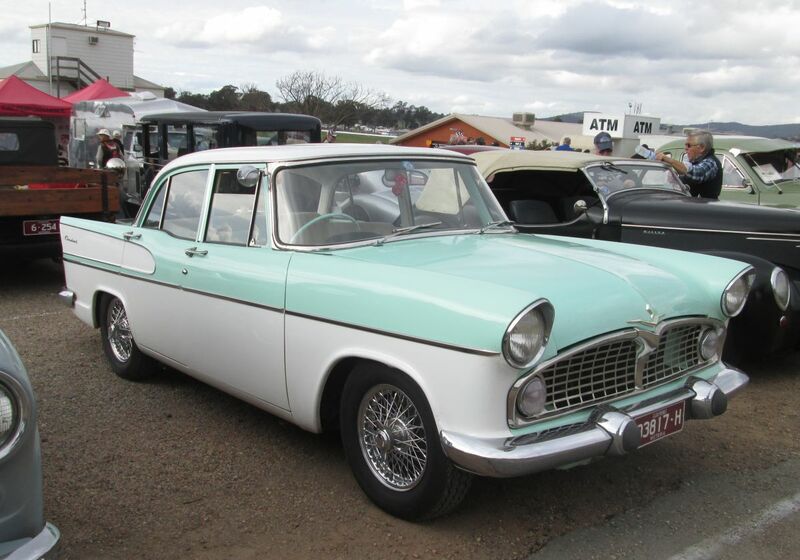 Too bad there’s not an Aronde wagon, the Australian ones were coachbuilt from the sedan and had four doors and a more squared-off rear roofline than the two-door French wagon. Here is one of those wagons! The link to the Brazilian Chambord reminded me of the earlier generation of the Vedette. We saw one in the wild last year, as we sat at a sidewalk table at a brasserie in Bourges. 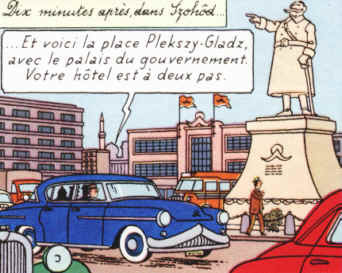 There it was, going through the center of town, a Vedette. I couldn’t get a picture of it in time, but it made an impression on me! Wow; now that’s not something I would have expected to see. Thanks! hehehe. thanks Stéphane. the cars I remember, the books blend into each other – the crazy Italian driver in the B20 Aurelia, the Jag Mk10 and this one stand out the most. Very cool! I think the idea of racing cars that are as close to stock as can be is great. Over the years I’ve pretty much stopped watching most North American racing as there is no resemblance between what’s on the track and what’s on the road. I agree Bill, it can be very interesting, so long as there is not one car that completely dominates. Going back roughly 30 years in Group A touring cars when they had to have road-going homologation cars you would have different cars suiting different tracks, eg the BMW M3 was lighter and more agile, while the Ford Sierra RS500 was more powerful but harder on its tyres. Production-based racing still exists, but at lower levels. I have never seen an Aronde. There was a Vedette in bright colours locally, which (if we call it, say, a ’59) was only about 14 years old when I used to see it put-putting about. I picked even then that the V8 noises coming from this smallish car didn’t seem to match. Jeez, at about 6 years old! This site is the right place for me. I had an Aronde that model stock with plenty of rust in that condition youve not missed anything Justy it sure wasnt fast. Aronde and Aronde and Aronde they go…! Thank you so much for the amazing pics. 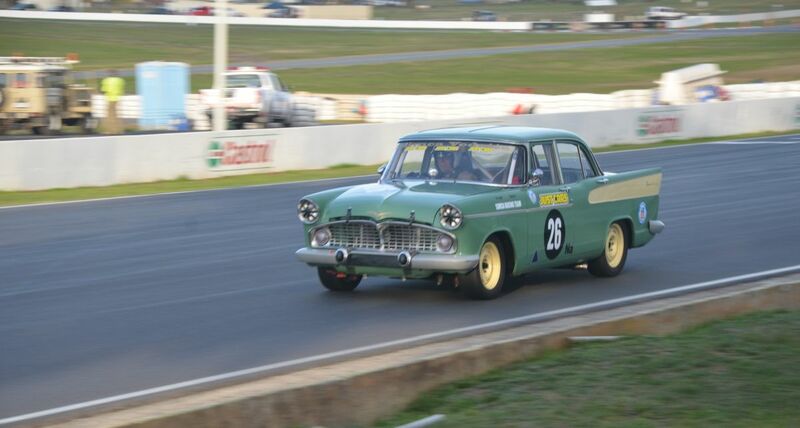 To see a Vedette (for me a Chambord…) on a race track will always make my heart beat faster. This car represents so much for us, Brazilians. Glad you enjoyed it Rubens! Great article & pics John. 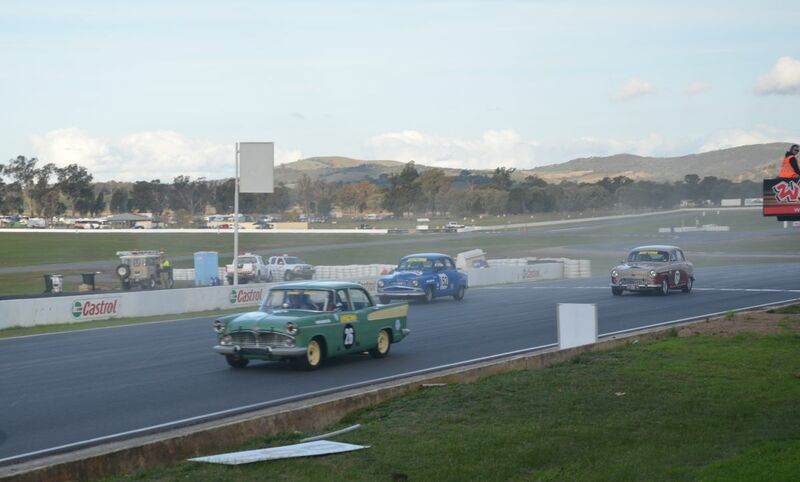 I’d love to do Historic Winton one day. I’m a regular at Lakeside, and I’d rather see historic cars than the $upercars series. Mt father-in-law is involved in historic racing, and I’ve attended meetings with him. I really enjoy it, you can wander the paddocks and its and get a good look at the cars, while the variety of vehicles competing is so much better than the ‘cookie-cutter’ cars you see in top level competition. Getting back to the Vedette, I’ve never seen one of those on the road. Back in the mid 70s, there was an early ’60s Aronde sedan running around Alexandria Virginia, usually trailing a large plume of oil-smoke! That car resided in a small garage down the street from a high-school friend’s home. Eventually, it just stayed in the garage – I guess there were no more parts or competent mechanics around to keep it running! Sophia Loren drives the ‘sports’ version – a Simca ‘Oceane’ coupe – in the 1962 French psychological thriller ‘Five Miles To Midnight’, co-starring Anthony Perkins as Sophia’s estranged, abusive husband. Great on-location footage shot in and around a grimy wintertime Paris, and a memorable scene involving the Oceane near the end! Big Paws on QOTD: Would You Buy A Diesel?